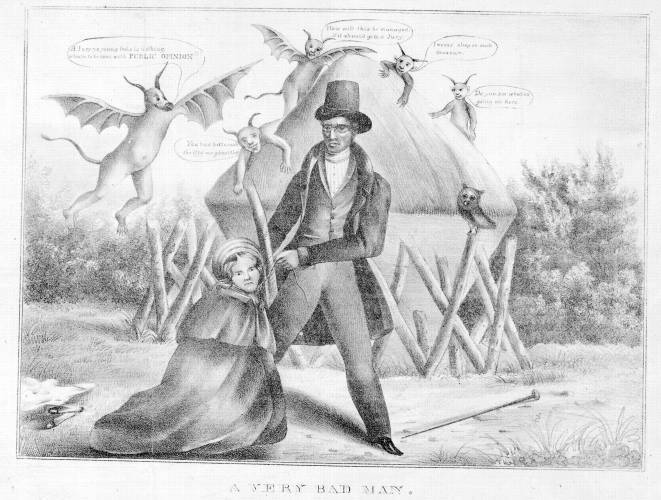 The first of two prints formerly thought to be anti-Jackson satires, but actually dealing with the sensational trial of Methodist minister Ephraim K. Avery in May 1833 for the murder of Sarah Maria Cornell. (See also "A Minister Extraordinary...," no. 1833-14). Miss Cornell, a young and pregnant factory girl, was beaten and strangled, and left tied to a post on a remote Massachusetts farm in December 1832. Avery was tried in May 1833 and despite considerable evidence against him (reported at length in the press) was acquitted on June 5. "Do you see what is going on here." "I never sleep on such occasions." "How will this be managed if it should go to a jury." "A Jury ye young fools is nothing. what's to be done with Public Opinion."